There are only a couple of days left in this decade and I still don't know what to call it. The ohs? The zeros? The two-thousands? The hundreds? The aughts? The BBC is calling it the noughties. Most people seem to refer to it simply as "this decade". Next week, they'll be calling it "last decade". What is the proper name for the years 2000-2009 of the Common Era? Many, perhaps most, references to decimal time of day refer to it as "metric time". I have noticed, however, that advocates of the metric system get annoyed by those who want "metric time" added to the metric system, because time is already included! Although the original metric system did not include a unit of time interval, the modern SI metric system does: the second. Standard metric prefixes are commonly applied in scientific use, including milliseconds, microseconds, nanoseconds, etc. However, larger metric units are not as common, and SI has compromised by allowing non-decimal multiples, such as minutes, hours and days, to be used with metric units. So the problem with metric time is not that there is none, but that metric and older units are being used together. Any arbitrary unit of time would work as a metric base unit. The second has been adopted, but it could have been the day or hour or anything else. The real issue is how to divide the day so that people can organize their activities. The metric system does not help, since there are 86.4 kiloseconds in a day. So instead we still use hours and minutes. I just came across this page on the world-time-zones.org website. It does a pretty decent job of describing decimal time. I have a few comments about the actual decimal times displayed there, however. I just watched the newly released DVD of the Star Trek movie, and I noticed that the stardates are different from the original series and its spin-offs. My first encounter with decimal time was through science fiction. Star Trek used stardates, which were originally four digit numbers plus one decimal. In college, I learned that astronomers actually use numbers similar to that to date star observations, called Julian Dates, which use the decimal to represent the time of day. Decimal time standards are also found in various other science fiction works, like Battlestar Galatica, Metropolis, Asimov, etc. The Doctor does not use decimal time AFAIK, but I would not be surprised if some alien race did at some point in the lengthy history of the show. The two specials that aired a few months ago are being repeated this week, which means that all the episodes for the entire year will be shown in the coming month. These are the final episodes with David Tennant playing the Doctor. There will also be a one hour doc saluting him. To the right you can now view the "current decimal time", which I will explain. The local decimal time is in French Revolution format, with ten decimal hours per day, one hundred minutes per hour and one hundred seconds per minute, counting from local midnight. Unlike the French revolutionaries, I made the midnight hour be 0 instead of 10. MJD is the Modified Julian Date, in which the digits left of the decimal are a count of days, and the digits to the right are the time expressed as a fractional day counted from midnight GMT/UTC. Thus, .98765 is the same as 9hd 87md 65sd GMT. Swatch counts 1000 .beats per day, from midnight at their HQ in Switzerland, which is one hour ahead of GMT. Thus, @987 is the same as 9hd 87md Central European Time. I found an interesting book in French on Google Books called Temps Decimal by J. de Rey-Pailhade, civil engineer of mines, published 1894. He proposed using the centijour (centiday), abbreviated cé, with metric submultiples such as decicé, etc. There are, in fact, several decimal time apps for the iPhone. I found three which display French decimal clocks. I don't expect anyone to follow this blog, but in case someone stumbles upon it, I'll explain why I created it. Before the Web, many individuals, including myself, speculated about the decimal reform of time, mostly in isolation from each other and from a wider audience. The early days of the Web saw many of these individuals posting their ideas online. Many of them were different from each other, while some shared similarities. I determined to make a survey of all of them, and to provide a forum for the proponents to interact. Alas, I was almost too late. Most of the existing sites were already stagnant, their authors having moved on to other interests, and with these sites already existing, and then with my own comprehensive site and later with Wikipedia, it seems that speculation was stifled by the glut of information on the subject. My site never had more than a handful of followers, and eventually it was mostly me, talking to myself. When my site went down unexpectedly, I decided to simply let it go. I have not thought about it much since then, but recently I have come across a few things that I would have posted about on my forum, and I thought, why not just blog it? 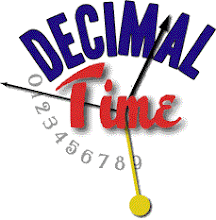 So here is a place I will post occasional things about decimal time, or anything else that crosses my mind.